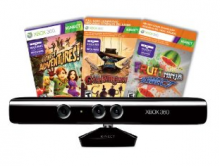 Head over to Amazon.com and grab the Kinect Sensor with Kinect Adventures for ONLY $99.99 with FREE shipping with Amazon Prime. This is a $30 price drop since yesterday. As you know, Amazon.com changes their prices very quickly so I have no idea how long this deal is going to last! This is the same price Walmart.com will have on Friday, here’s a great way to get it without waiting in long lines! Remember, if you don’t have Amazon Prime, you can try it for FREE for 30 days! Offers Nov 24, 2011 in Amazon, BlackFriday, Walmart · Expired!